There’s no shortage of indie developed, retro-inspired video games these days. Pixel art is now considered a respected design choice, rather than the technical limitation it once was. In fact, with so much interest in the aesthetic style and so many games making use of it, there’s probably a case to be made for starting a new sub-genre. On paper, Cursed Castilla, from developer Juan Antonio Becerra – otherwise known as Locomalito – is yet another nostalgia-fueled action platformer seizing an opportunity to make hay of this renewed interest in retro-style games. It features 16-bit chiptune, sprite graphics and typical side-scrolling gameplay. But 15 minutes into my first playthrough, I’m suddenly very aware this is far more special than a by-the-numbers copycat. In fact, I’m almost immediately convinced that Cursed Castilla has an X-factor that elevates it to the very top of this pseudo-genre. Remember when grandpa used to complain that the CDs you bought him didn’t sound like his old vinyl records, claiming their hissing and fuzzy static added to the ambience? Well, it seems Locomalito and co. echoed a similar complaint with retro gaming because Cursed Castilla feels every bit like a ROM classic from the arcade-era. Rather than HD-unifying its pixel art and smoothing out all the kinks of the archaic side-scrolling gameplay formula it takes its inspiration from, the game embraces those quirks and imperfections. Complete with CRT television style scan-lines, occasional background stutter, and in combination with an option to add a border – one side reading “insert coin here” – on either side of the 4:3 resolution, Cursed Castilla transforms your modern home console in a blocky arcade-machine. Cursed Castilla certainly feels like being transformed back to a bygone era. The game’s intro cut scene is just like an 80s action platformer; “ROM OK,” cue melancholy chiptune over the top of scrolling text, detailing a tragic backstory – it’s wonderful stuff that fills the cockles of your heart with warm nostalgia. Indeed, Cursed Castilla betters those games in many respects, streamlining gameplay and toning the difficulty to a challenging but fair level. The pace and intensity are still every bit as frenetic; enemies fly at you from all directions and there are frustrating trial and error deaths as one learns the attack patterns of bosses, but Cursed Castilla’s finesse strikes a balance that feels almost rhythmic to control while still testing the skills of veterans and newcomers alike. Cursed Castilla’s ghoulish enemies, eerie locations, and story tidbits are suitably fantastical, but don’t be fooled into thinking there’s no rhyme or reason to their placement. Locomalito has intricately woven Spanish history into the game, bringing to life legendary tales from pre-unified Spain such as Amadis of Gaul, a sixteenth-century Spanish chivalric romance. The historical context really shines across much of the game’s grisly, Spanish themed level design, but especially during the absolutely spectacular boss encounters, that are typically tiered in stages, rather than singular encounters. The Crazy Quixote and Mendoza boss fights are particular highlights. 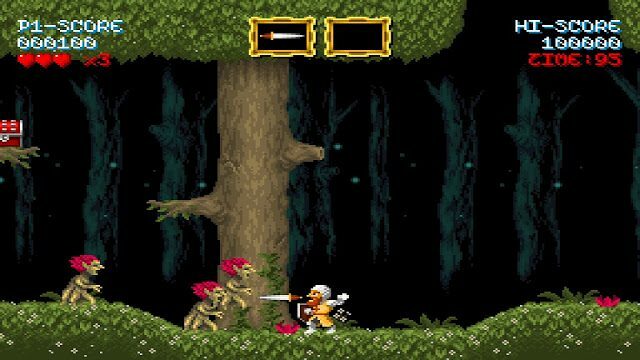 Cursed Castilla does more than pay homage to iconic franchises like Ghost and Goblins. The game is a love letter to veteran gamers with memories of arcades that don’t exist anymore. It recaptures the essence of what made frantic platformers like the aforementioned one so entertaining but manages to iterate and weave enough of its own flavor to give it enough of a voice to stand on its own two feet. Retro enthusiasts, platforming fans, or curious younger gamers looking to school themselves with some entertaining homework about the video gaming industry’s origins, you must play Cursed Castilla.